Winter Cold time is the best time for buying a hot tub. “Consciousness loves contrast,” said the philosopher Alan Watts. When it’s cold, you want heat; when it’s hot, you crave cold. You could try fire to warm up in the cold Northwest winters, but water is better – hot massaging jets with no need for blankets, sweaters, or even clothes. When you’re finished with that leaf-raking, come home from a frigid Seahawks game, enjoyed the new snow at Crystal, or strolled through the Arboretum, you could (a) gather some wood, clean out the fireplace ashes, and try to get a fire going or (b) jump into the hot tub. Choose (b). You get an added bonus for buying a hot tub in winter: the model year transition sales. The model year transition sales are absolutely the best time to buy a hot tub! At Olympic Hot Tub, all our 2014 Hot Spring Spas are marked down for the Big Year End Clearance to make way for the 2015s. Don’t wait for the days to get long and warm. Enjoy your hot tub under the snow, the rain or the stars. You’ll love how the heat feels on your cold body – you’ll recover faster, your blood will flow better, you’ll have more energy, and you’ll get a good winter’s nap afterwards. 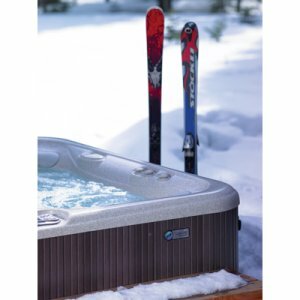 Visit one of our 5 Olympic Hot Tub stores today and see how quickly we can install your own winter wonderland.